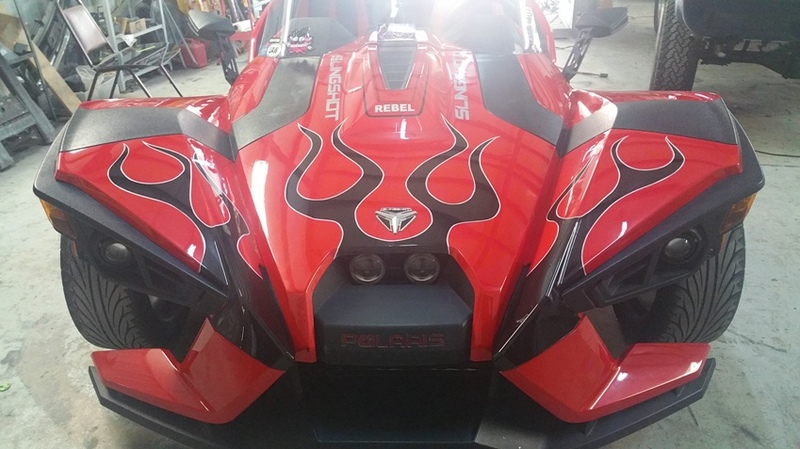 This Polaris Slingshot paint job came in for an updated look to the front end. Instead of the rebel flags, the owner wanted black flames to cover the front. 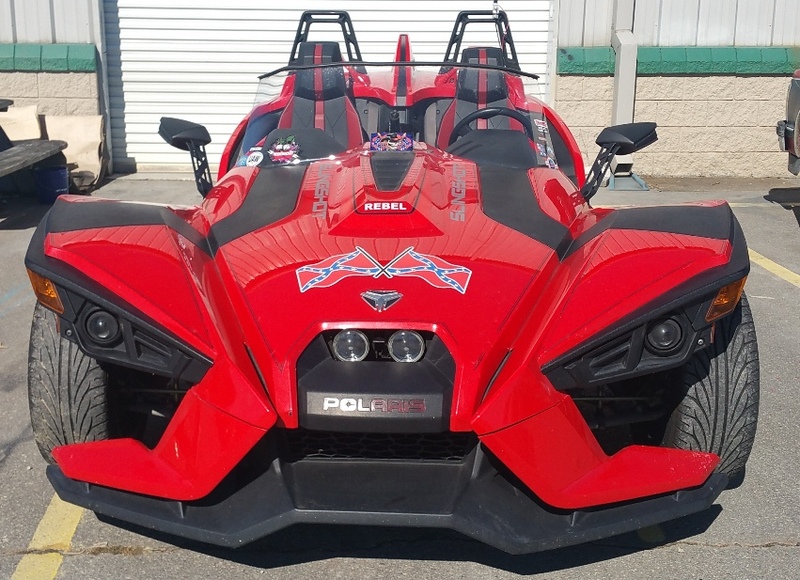 This is the first Slingshot we’ve had the pleasure of working on. 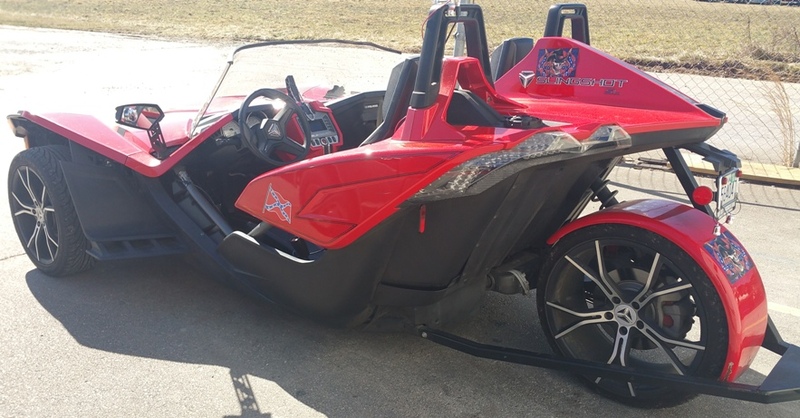 It’s in between a motorcycle and a sport car, and is classified as a three-wheeled motorcycle. The owner came from over 3 hours away in Virginia to get the custom painted flames painted on it. He said he loves riding it through the mountains and it can go up to 150 mph! Tim carefully peeled off the rebel flag decals using with a heat gun, and sanded down the entire area in the front. He taped off the lines for the flames with some fine line tape, and painted them black with the white trim, as you can see below. Different artists and shops will have different styles of flames. 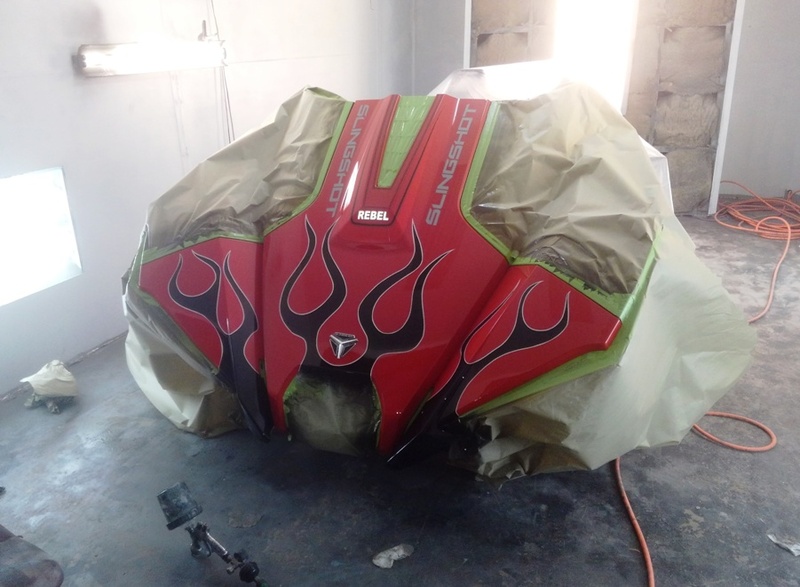 You can see the style of Tim’s flames here, and he can, of course work with the design you want. To match the current paint scheme, we painted the flames black with a thin white border on all sides of the front end. It goes perfectly with the rest of the Slingshot’s colors. It doesn’t take a full paint job to update the look of your ride. We can always work with what you have to add or remove certain elements and create a new look. In this case, all it took was removing some decals and painting on what they owner really wanted. TD Customs is all about the custom look. We’ll paint anything you’ve got in any paint scheme you want, but we love anything out of the ordinary. Tim always says the custom paint jobs break up the factory-original ones and the average collision repairs. It lets him get creative, and gives our customers something they won’t see everyone else with out on the roads. If you’re looking for a custom paint job or anything else we can help with, don’t hesitate to contact us. We’ll have your ride looking new and improved in no time! While you’re here, be sure to check out our Photo Galleries, especially the Custom Paint Jobs one! 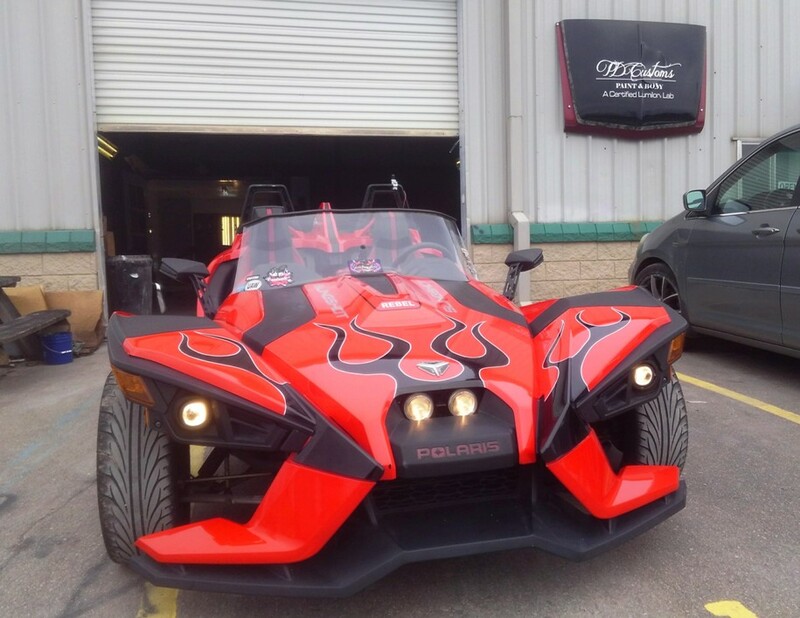 No Replies to "Polaris Slingshot Paint Job: Adding Flames"